United States, a country that at the time of George W Bush in power, ever put Indonesia on top as a nest of terrorists who threaten the existence and judged fairly the interests of United States in the world. In line with the United States against provoking China as a country that is developing very rapidly and cause an imagethat China is a new super power as well as friendly to the countries they are increasingly creating a presumption against China that “The Red Dragon” such as if wants to develop its hegemony in the area of East Asia, Southeast to the South. Author just wanted to describe about the position of Indonesia that are cross among Super Power States against America And China which are both those countries alike wanted to show themself as “older brother” guarantor of security for Indonesia Archipelago. Flashback on the history of the 14th-15th century when the Western for the first time landed in the Indonesia Archipelago and slightly backwards during the 800 years ago when The Chinese influence in any land archipelago. Both are the same interest and intent i.e. to extend their hegemony as well as perform missions that are both expansive through a field of economic, political and social culture with the main aim is to get the “gold, gospel and glory “. Let’s step forward to the story in the beginning of the 20th century in which there are two strength of bi-polar that the United States and the Soviet Union in the “cold war” atmosphere which is a form of ideological warfare through combat information to create “the new world order” and keep to the triumphant the ends as “gold, gospel and glory”, then the collapse of the Soviet Union and the end of the 20th century as a manifestation of a whopping hegemony followed by the United States as the sole power in the world without a rival with proven crony of Soviet increasingly towards capitalism embraced by United States. Back to “gold, gospel and glory ” that the United States easily several times ruled the region of the Middle East as largest areas of mineral and petroleum resources in the world’s looks with his super control America kills the Arabs leader such as Saddam Hussein, Moamar Ghadaffi as well as Osama Bin Laden. China, the country’s “The Red Dragon” from the Asian mainland, is a country that has been hamstrung by its system at the end of the 19th century until the beginning of the 20th century. However, it looks like a challenge for China that has heavy identity and nationality identity up to 5000 years ago. China has risen, becoming the “super power” country through an unique phases. The country emerged as a producer of goods to knockoff goods – ranging from technology that is simple to super technology; starting from children’s toys; electronic equipment; technology development of motor vehicles; and a pretty thrilling world mainly United States is China presents as a country of manufacturer of sophisticated war equipment and cutting edge as well as mass produced for the benefit of his country and the defence in sale to the countries of the area. 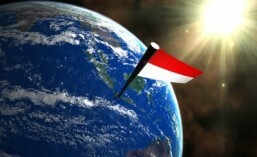 If we look at the conditions as well as what is being planned by the United States and China today, then it is appropriate that our nation Indonesia should become “a good boy but smart” Indonesia must remain vigilant, although China would agree to the transfer of technology from the missile C-705. In line with this, when the United States continue to give “good toys” for”her little brother” but vigilance should still be awake so that Indonesia does not “sold” and no one else point of territory and wealth of Indonesia become ” the success of purpose gold, gospel and glory” for China and the United States. This entry was posted in Internasional, Nasional. Bookmark the permalink.